Skyrim, the northernmost province of Tamriel, is a cold and mountainous region also known as the Old Kingdom, Mereth, or the Fatherland, or Keizaal in the dragon tongue. Many past battles have given it a ravaged appearance and many ruins. 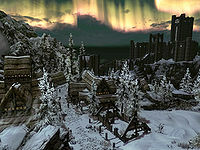 Though currently inhabited primarily by Nords, the Elves who they replaced had resided there since time immemorial. The sovereign, the High King of Skyrim, is chosen by the Moot, a convention of jarls. A jarl is a regional ruler chosen through heredity and, rarely, through right of arms. The High King typically rules until death, though acts of dishonor, particularly the appearance of cowardice, can lead to the recall and reconsideration of the Moot. Since the Pact of Chieftains was signed in 1E 420, the Moot does not give serious consideration to anyone but the High King's direct heir unless one is not available. Morrowind lies to the east over the Velothi Mountains, Cyrodiil is south beyond the Jerall Mountains, Hammerfell (and the latest incarnation of Orsinium) is to the south and west, High Rock is past the Druadach Mountains to the west, and the Sea of Ghosts runs along the province's long northern coastline. 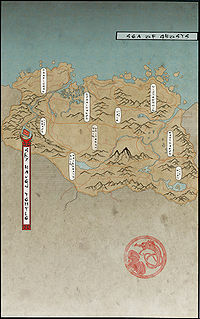 Skyrim holds four of the five highest mountains in Tamriel (the Red Mountain being the only one outside Skyrim). Much of the northern half of Skyrim is cold and covered in snow. However, the southern regions of the province are relatively mild. The Nords long ago divided the province into nine geopolitical regions known as holds, each of which has a ruling jarl. Each hold is a large area of land roughly equivalent to a county in Cyrodiil, each individually governed by a jarl who maintains court in the hold's capital city. There are nine of them in total: Haafingar, Hjaalmarch, The Pale, Winterhold, Eastmarch, The Rift, Whiterun, Falkreath, and The Reach. Winterhold, Eastmarch, The Rift, and The Pale lie to the north and east of the province and are known as the Old Holds and remain isolated from the rest of Tamriel, both geographically and politically. In contrast, the western hold of The Reach has historically been more cosmopolitan and members of all the races of the continent have made their homes there. The Pale is a northern boot-shaped hold of Skyrim, one of the four known collectively as the Old Holds. The hold is a barren realm covered by vast fields of ice and snow, some scattered mountains, and some pine forests. 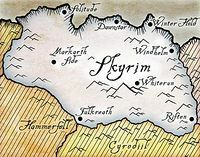 It stretches from the center of Skyrim all the way to its northern coast. Lake Yorgrim marks the eastern corner, while the capital Dawnstar is a busy port found along the northern coast. 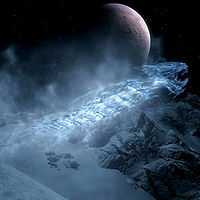 The hold's distinctive boot shape is due to it curving around the mountain range which forms its border with Winterhold. Winterhold is the northernmost hold in Skyrim, and has weather to match. The Sea of Ghosts is off its northern coast, Eastmarch is to the southeast and The Pale is to the south and west. The city of Winterhold was once located in the hold, but it was mostly destroyed during the Great Collapse. 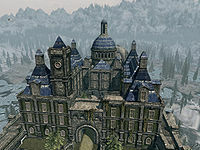 The College of Winterhold is the most notable feature of the hold, which was spared even though the Great Collapse tore down most of the city around it. What remains is a meager village, technically the hold's capital city, near the entrance to the College. 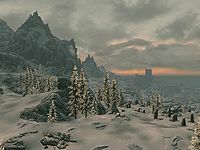 Winterhold consists of snowy coasts, as well as an even snowier mountain range which marks the border between Winterhold and the Pale, and some of the northern border to Eastmarch. Between the mountains and the sea to the east lies an ice plain, where the elements are at their harshest, and life at its most scarce. Rock and ice shelves form the barrier between Winterhold and the sea to the north and east, dotted occasionally with shingle beaches. Hjaalmarch, or Hjaalmarch Hold, is a lowland coastal hold in Skyrim. Roughly half the hold is constituted by the Drajkmyr marsh, south of which is the capital and only settlement Morthal (although some farms dot the tundra). The region is veined with waterways that empty into the Sea of Ghosts, and the southern and eastern mountains near its borders further isolate the area. Hjaalmarch is home to the Karth delta, also called the Mouths of the Karth, where the mighty Karth River and the smaller River Hjaal empty into the Sea of Ghosts through a variety of intricate channels. The Deathbell flower is known to be abundant throughout the swamps. Many ruins dot the hold, including the legendary Labyrinthian. Combined with the fog that surrounds the marshes and the creatures that stalk the land (Wispmothers purportedly originated here), Hjaalmarch is considered one of the more mysterious holds in Skyrim. Haafingar, or Haafingar Hold, is a relatively small, mountainous, coastal hold in northwestern Skyrim. Its capital is the famed city of Solitude, and the two are sometimes treated as one and the same. Solitude is perched atop a large rock outcropping towering high above the end of the Karth River and the massive Karth delta. However, Haafingar is far more than just Solitude. The Karth River allows for a great deal of commerce in Solitude and the town of Dragon Bridge (mostly in timber and fish), and the long coastline with the Sea of Ghosts is littered with frozen shipwrecks and treasures. The mountain ranges are filled with caves and ruins where bandits and creatures make their homes. The hold shares borders with two other holds, the Reach to the south and Hjaalmarch to the southeast, and the province of High Rock borders it to the west. The mountains of Haafingar are only the tapered end of the Druadach Mountains, an enormous range of jagged mountain peaks to the south which rise up among the clouds of the Reach. The Reach is a geographic region surrounded by High Rock, Skyrim and Hammerfell. Its territory once extended into High Rock, but that portion was split off to create the Western Reach during the late First Era and has remained separate ever since. The region was historically inhabited by the native, Daedra-worshipping Reachmen, who were primarily of Breton descent. Control of the Reach has changed hands between the Reachmen, Nords, and even the Cyrodilics numerous times over the centuries in various conflicts, and the Reachmen became well-known for resisting foreign rule by using ancient magic and an intimate knowledge of the landscape to their advantage in guerrilla warfare and espionage tactics. In the Fourth Era, the Reach is the southwestern hold of Skyrim. Near the southwestern corner, the capital Markarth, formerly a Dwemer stronghold, emerges from the living rock of the Druadach Mountains, which transition into the Jerall Mountains near the hold's southeast corner. The Karth River begins in the southern region and drains the mountains, running like a deep gouge through the middle of the hold. Settlements such as Karthwasten and Old Hroldan can be found along the Karth. The peaks of the Druadach range lie to the west of it, and high bluffs typically rise on the east leading to grassland and tundra. The Reachmen and settled Bretons constitute the demographic majority of the Reach and its various settlements, and an Orc stronghold can be found in the steppes of the mountains in the south of the hold. Whiterun Hold is a hold in Skyrim, located roughly in the middle of the province. 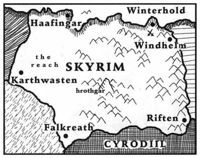 It borders six of the other eight holds in Skyrim, the exceptions being Winterhold and Haafingar. Giants are often seen traversing the landscape while herding mammoths to grazing areas or back to their camps. Surrounding the capital, Whiterun, are fertile plains dotted with farms that supply the food for much of Skyrim. The other notable settlements in the hold are Rorikstead and Riverwood. Falkreath Hold is a southern hold in Skyrim along the border with Cyrodiil and Hammerfell. It's the second southernmost hold in Skyrim, after the Rift. The capital is Falkreath; the abandoned settlements of Helgen and Neugrad Watch are also located here. 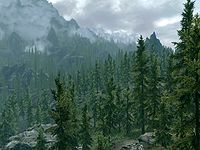 Home of Skyrim's famous Pine Forest, Falkreath Hold is covered in a fine mist that makes the land seem without season. The mountains rising above Falkreath are well above the snow line, striking a stark comparison to the rest of the hold. The most distinguishing geographic feature is Lake Ilinalta, which covers a large portion of the central region and acts as the source for the White River. 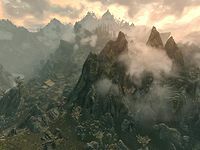 The Rift (sometimes called Rift Hold), the southeastern hold of Skyrim, is a temperate region northwest of the intersection between the Velothi Mountains and the Jerall Mountains. It is one of the four holds known collectively as the Old Holds. The capital city of Riften is nestled in the expansive Fall Forest, on the shores of Lake Honrich, which is drained by the Treva River and Lake Geir. The relatively mild climate allows for thriving agriculture. Although the history of the island of Solstheim is somewhat complicated, there was a time when it was considered a part of Skyrim. The Skaal, an offshoot tribe of Nords, inhabit the northeastern corner of the island. In 3E 433, the Nords of Skyrim launched a successful campaign to claim the whole of Solstheim. In 4E 16, the High King of Skyrim formally gave the island to Morrowind as a refuge for the Dunmer after the events of Red Year. The northern half of the island is snowy and mountainous. 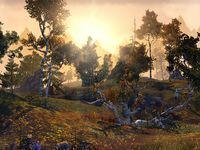 The southern half was originally covered in coniferous forests, but after the Red Year it was transformed into an ashland similar to those seen in Morrowind. Bleakrock Isle, also considered a part of Skyrim, is a small, snowy island in the Sea of Ghosts between Windhelm, Blacklight and Solstheim. A small populace of the Nords inhabited the Bleakrock Village until they were driven from the island by the Daggerfall Covenant in 2E 582. It is unknown if the island was resettled afterwards. Skyrim's history is mostly that of the Nords. 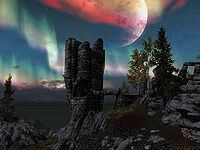 The Nords believe the sky, Kyne, breathed life into them at the summit of the Throat of the World, which is now considered the tallest mountain in Tamriel (the Red Mountain was acknowledged as the tallest before its eruption during the Red Year). While historians tend to portray Ysgramor as the first Nordic settler of Skyrim, ushering in concurrent waves of immigration from Atmora, this is not the case. While their exact origins are unknown, the most widely accepted theory is that the early Nedic peoples (a now extinct culture) settled in Skyrim after arriving from Atmora well before the arrival of Ysgramor, and from there spread to the rest of Tamriel. In ancient times, Skyrim was ruled by the malevolent Dragon Cult. This early society revolved around the worship of dragons through intermediaries known as dragon priests, who ruled as gods above men. Sometime in the late Merethic Era, the mythical Dragon War saw the overthrow of the Dragon Cult when Alduin, Akatosh's firstborn, was defeated atop the Throat of the World. The veneration of animals gods was eventually replaced by the Eight Divines. The many mountain ranges in and around the province resulted from unknown cataclysms in the Dawn Era. 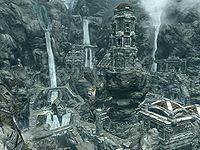 The only known relic from this time is the Skyforge, an ancient, powerful, and still-active forge built into the living rock in modern-day Whiterun. Who built it remains a mystery, but the Elves feared it, and this led the invading Atmorans to claim it for themselves. The Aldmer and Snow Elves occupied Skyrim until the late Merethic Era, when the final wave of Nordic immigration from Atmora, led by Ysgramor, finally established Nordic supremacy in modern-day Skyrim. Settlers from Atmora crossed the Sea of Ghosts and made landfall here many times, often clashing with those who had already established themselves. These early settlers called the land "Mereth", after the Elves that roamed the untamed wilderness. While the Nedic peoples were generally peaceful, the arrival of Ysgramor and the proto-Nords sparked a long, antagonistic chain of conquests that ultimately expelled the Elves from Skyrim. The instigating spark of conflict was the infamous Night of Tears, where the Elves attacked the human settlement of Saarthal. According to Imperial scholars, the Elves realized that this newer race could outpace their relatively stagnant own. Others posit that the human inhabitants had discovered a powerful artifact, the Eye of Magnus, that the Elves desired. Nonetheless, Ysgramor escaped the carnage, returning to Skyrim with his now legendary band of Five Hundred Companions, slaughtering the Elves and establishing man as the foremost race in Skyrim. Ysgramor's clan expanded their territory, and it continued to expand and contract by winning and losing territories in Morrowind and High Rock during the First Era. Elven rule of Skyrim is thought to have ended under the reign of King Harald (1E 143 - 1E 221), though pockets of Snow Elves hid away in the wilderness. In the years after 1E 420, however, the Dwemer of Clan Kragen migrated into Skyrim from Resdayn, following in the footsteps of Clan Rourken's exodus. Clan Kragen founded the city of Arkngthamz, which flourished despite constant attacks from the Nords. The success of Arkngthamz encouraged other Dwemer clans to settle in Skyrim, and these joined with Clan Kragen to form a loose alliance of four city-states that were considered unassailable. Clan Kragen's presence eventually extended further west into the Dragon's Teeth Mountains, where they carved out an even larger bastion called Arkngthamz-Phng. The prosperity of Skyrim's Dwemer city-states was relatively short-lived, as the discovery of rich deposits of Aetherium and the creation of the Aetherium Forge immediately shattered the alliance and launched decades of internal conflict. With the Dwemer distracted and weakened, the Nords under High King Gellir finally conquered the squabbling city-states in only three years, though the Dwemer would return a century later and reclaim their former holdings. When the entire Dwemer race disappeared around 1E 700, they left behind the Falmer, Snow Elves who they had allowed to take refuge with them and then twisted into rebellious slave monsters. They remained under the ground, occasionally making forays to the surface and creating legends among the Nords of their presence and malevolent intent. Orc strongholds dot the wilderness; many Orcs were escorted into Skyrim by the Imperial Legion following the sacking of Orsinium in the early Fourth Era. Besides the Orcs, the Elven population has also increased due to the Red Year of 4E 5, when natural disasters in Morrowind sent many Dunmer fleeing into eastern Skyrim. Following the Great War, Thalmor officials hunted for and persecuted Talos worshippers, thus bringing some small measure of Elven rule back to Skyrim. While these smaller creatures vied for dominance over the millennia, the giants have been largely ignored (and often protected by law). Nord architects are masters of creating structures that last for generations, with designs that can be found from Bruma to Solstheim dating over 3,000 years old. Many ancient Nordic ruins built into the mountains dating back to the Merethic and First eras remain standing throughout Skyrim. They are towering, foreboding structures of black granite. Some were settlements and temples from when the Nords lived under the rule of the Dragon Cult and after; others are burial tombs for the honored dead. Most modern buildings in Skyrim are built partly underground to conserve heat, and are made with stones, with wood used only for support, and roofs of straw. The Nords are known as masters of lumber construction, and these houses are essential to keep in heat in the freezing climate. Some Nord wells are known to have spikes attached to the bottom of buckets to crack through ice. After the reign of Ysgramor, Nord stonesmiths created a method of erecting igneous rock. Initially, these blocks were hewed from porphyry deposits, although by the Second Era, they were somewhat supplanted by hard-wearing granite and volcanic stone gathered from the eastern side of the province. Each block was slotted together without requiring seams or mortar, allowing huge walls, structures, and towers to be constructed with both ease and haste, even with irregularly-shaped stone. Many of these structures proved difficult for invaders to dismantle, such as the Old Fort, a royal bastion on Skyrim's northern frontier, which still stood in the mid-Second Era after being built in the time of the First Empire. 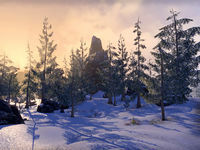 Skyrim's frigid environment still supports a great wealth of flora, notably its many pine forests. 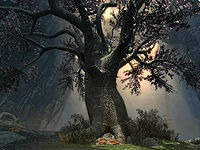 Many of its plants and fungi are useful for alchemy, including bleeding crown mushrooms, the deathbell flower, jazbay grapes, and nightshade. 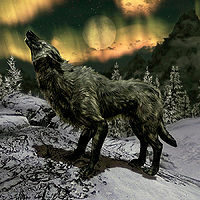 Tundra cotton is not only used for making potions, but for making many of the fabrics for clothing and other purposes in Skyrim. The beasts of Skyrim are as diverse as they are dangerous. Horkers line the northern coast, posing a greater danger to hunters and fisherman, and ice wolves prowl in pairs all over the province. Slaughterfish and other types of fish glide through the rivers and lakes. Other common beasts roam the wilderness, and rumors abound of less common ones like werewolves and wispmothers. Many of them, such as hagravens and luna moths, yield body parts used in alchemy. Ice wraiths and other creatures are hunted in the mountains by young traditional Nords as rites of passage. Undead draugr still guard the ruins of the province. 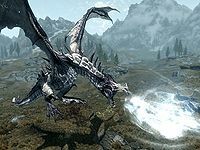 Of course, the most legendary "creatures" are the majestic and intelligent dragons, who have left their mark on Skyrim in more ways than one. Ancient structures dedicated to the Dragon Cult and "word walls" in the language of the dragons still dot the landscape. A small island northeast of Skyrim and south of Solstheim. A famous school for Magic in the city of Winterhold. A busy port on the northern coast and capital of the Pale. The main pass and one of the few traversable roads leading through the Velothi Mountains between northwestern Morrowind and eastern Skyrim. The capital of the eponymous hold is in southwestern Skyrim, close to the border with both Cyrodiil and Hammerfell. A lake in the western Rift. 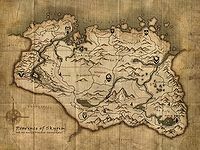 At the extreme northern tip of Skyrim's Broken Cape, it is the place where tradition holds that Ysgramor's Five Hundred Companions made landfall. A lake in west-central Falkreath Hold, in the middle of Skyrim's Pine Forest. A western river running the length of Skyrim before emptying into the Sea of Ghosts near Solitude. An ancient Nordic ruin. Named for the labyrinth built sometime in the First Era by Arch-Mage Shalidor, although the ruins themselves are much older, having been the city of Bromjunaar, the capital of the Dragon Cult. The capital of the Reach is in the southwest corner of the province. The fairly small, humble town of little economic or strategic importance is noteworthy as the capital of Hjaalmarch. A secluded pass through the Jerall Mountains on the Cyrodiil-Skyrim border. The capital of the Rift, long a center for crime, lies close to both Cyrodiil and Morrowind. An ancient Nordic city that was sacked in the Night of Tears, Saarthal is where the Eye of Magnus was found in the Fourth Era. Fortress stronghold in the Druadach Mountains built by Reman Cyrodiil's Akaviri Dragonguard. A city located in Hjaalmarch, abandoned sometime during the Fourth Era. A major port city and capital of Haafingar. The highest peak in the province of Skyrim. Though once considered second to Red Mountain, it is now known as the highest mountain in all of Tamriel. A river at the center of the Rift. It flows from Lake Honrich to Lake Geir. The longest river in Skyrim, stretching from the south of the province to the northeast corner. Its source is Lake Ilinalta, north of Falkreath. It flows northeast to join the Sea of Ghosts past Windhelm. A city in central Skyrim, and the capital of Whiterun Hold. Built at the spring of the White River. The capital of Eastmarch lies close to the border with Morrowind. It's the famed location of the Palace of the Kings. The capital of the eponymous hold was once quite prosperous, but was devastated in the Great Collapse in 4E 122. 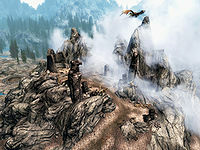 ^ While Solitude has been the seat of the High King and thus the capital of Skyrim for "centuries" prior to 4E 201 because of its importance to the Empire, Windhelm was the capital of the kingdom from the time of its founding by High King Harald at least until the collapse of the First Empire of the Nords in 1E 420. One of Skyrim's loading screens also mentions that Winterhold once served as capital, but does not specify when. ^ Rislav The Righteous states that Kjoric the White was killed eight months before certain events in 1E 478, placing his death either in that year or in 1E 477. ^ Hoag Merkiller was said to have died at the Battle of Glenumbria Moors, after which Wulfharth ascended to the throne. However, some sources place the date of the battle at 1E 480, and others at 1E 482. ^ Gellir could not have reigned any earlier than 1E 533. His chief accomplishment is the conquest of Skyrim's Dwemer city-states, and according to Arkngthamz-Phng, those city-states were not established until the decades after Clan Rourken founded Volenfell in 1E 420. Since the consecutive reigns of four other High Kings span the years between 1E 420 and 1E 533, Gellir could only have ruled sometime after 1E 533. 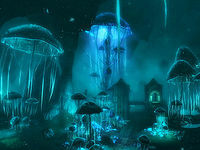 The Aetherium Wars notes that the Dwemer reclaimed their lands "a century" after Gellir's conquests, and since the Dwemer had disappeared by 1E 700, it is likely that Gellir's reign occurred before the end of the 6th Century of the First Era. ^ Skyrim split into independent Eastern and Western kingdoms in 2E 431 amid a dispute over the succession. Freydis was proclaimed High Queen in Windhelm, and her successors (who include Mabjaarn Flame-Hair, Nurnhilde, and Jorunn the Skald King) ruled Eastern Skyrim. Svartr was proclaimed High King in Solitude, and his successors ruled Western Skyrim. For game-specific information, see the Arena, Shadowkey and Skyrim articles.